I was at the Santa Barbara airport last year flipping through magazines when I spied this darling cookie. I bought the magazine, but never made the cookies until two days ago. I'm so glad I did! These bite-size(about 1 1/2 inches) cuties live up to their name and aren't just all about looks. They are a soft chew, and the buttery cookies blend well with the peppermint filling. There was a little bit of extra effort involved in these cookies, but I thought it was rather fun, and so worth it! 1. Beat butter at medium speed with a heavy-duty electric stand mixer until creamy; gradually add sugar, beating until light and fluffy. Add egg and vanilla, beating until blended, scraping bowl as needed. 2. Combine flour, baking soda, and salt; gradually add flour mixture to butter mixture, beating at low speed until blended. 3. Divide dough into 2 equal portions. Roll 1 portion of dough into a 12- x 8-inch rectangle on a piece of lightly floured plastic wrap. 4. Knead food coloring paste into remaining portion of dough while wearing rubber gloves. Roll tinted dough into a rectangle as directed in Step 3. Invert untinted dough onto tinted dough; peel off plastic wrap. Cut dough in half lengthwise, forming 2 (12- x 4-inch) rectangles. Roll up each rectangle, jelly-roll fashion, starting at 1 long side, using bottom piece of plastic wrap as a guide. Wrap in plastic wrap, and freeze 4 hours or up to 1 month. 5. Preheat oven to 350°. Cut ends off each dough log, and discard. Cut dough into 1/4-inch-thick pieces, and place on parchment paper-lined baking sheets. 6. Bake at 350° for 6 to 7 minutes or until puffed and set; cool cookies on baking sheets 5 minutes. Remove to wire racks, and cool completely (about 30 minutes). 7. Place Peppermint Frosting in a heavy-duty zip-top plastic freezer bag. Snip 1 corner of bag to make a small hole. Pipe about 2 tsp. frosting onto half of cookies; top with remaining cookies, gently pressing to form a sandwich. 1. Beat butter and cream cheese at medium speed with an electric mixer until creamy. Gradually add powdered sugar, beating at low speed until blended. Increase speed to medium, and gradually add milk and peppermint extract, beating until smooth. and I'm Lovin' it Fridays. I LOVE these cookies! They are so dang festive looking and I bet they are delicious!!! I just might have to try to make these! Thanks for the recipe! You are always so darn creative! I just linked up to your cookies! Can't wait to start baking! These are the cutest cookies ever. You just keep out-doing yourself. I am going to make a batch of these tomorrow. What great cookies to pack in bags. Amazing!! I wish I can participate in this but my oven is broke & we don't have money to buy a new oven. (bad financial situation) lol Hopefully when I eventually get a new oven there will be some other fun baking hop I could then join in. Delighful looking cookies. I like your way of wraping every single one separately; ready for Christmas tree, or maybe to be given as a gift. Oh, I am so loving these! So cute!!! And I totally adore your beautiful table cloths btw! Those red cups!!!! So pretty! I love how you wrapped those! So very cute. Absolutely adorable, I love how they look, and I love the cream cheese peppermint filling. Beautiful and tasty. These are adorable! I just aded them to my "must make" list. I like the idea of wrapping a few in a cello bag like candy to give away!They make such a pretty presentation! These are gorgeous and creative! They look delicious too, thanks! These are perfect for a Christmas tray! Super cute, perfect for a Christmas tray. Those are wonderful! I love how festive they look. OH, these are just perfect, I have the absolutely perfect plate to serve them on. I love the colors and then to take them another notch higher and add frosting between 2 of them! Wow. These will be a hit. I can't wait to try them. You always have the funnest ideas. I buy magazines just for 1 recipe too. Glad you tried these out. Have a wonderful weekend. Sue, these are so flipping cute! I just love the look of them. You are amazing! Amazing!!! Very beautiful cookies!!! Perfect for Hollydays gift! I HAVE to make them!!! I do love visiting your site, you come up with the most amazingly beautifully presented little bits of sweetness, such awesome ideas. Thanks for sharing. They look amazing. Oh, you are right, these would be adorable in a jar with a bow on top for a gift! I love them! I just love how you always find the cutest recipes for cookies. These would be so pretty as a gift and I love the peppermint flavor. Great pick and good job on your cookies. What beautiful little cookies! They are just adorable. These cookies look so festive and pretty! cute cute cute, would love to have a cookie swap with you, your Christmas cookies are the sweetest. Oh suc danggg cutey cookies , absolutely pretty!! Lovely cookies! :) I know what to make for my guests to take home this Christmas. Thanks for the recipe. Just made these fun cookies. I made mine bigger but they are absolutely delicious and so cute. They'll become a family tradition at our house. I love your cookies! So festive - they scream Christmas-fun! SO creative and beautiful!!! Well done! These are crazily beautiful. I am so in love with these! These really are extremely pretty cookies, and your blog is fantastic! I look forward to exploring it in depth! I've decided to put you on auto-comment because everything you make makes me want to say "oh, those are soooo cute! Or those look so sweet!" I really enjoy your blog Sue. Wow! These are really the perfect Christmas cookie! These are beautiful! They would be so great on a Xmas cookie tray. Thanks for sharing. Oh my goodness those look amazing!!! YUM!! these are so cure! and I love peppermint as do my kiddos, will have to bookmark these....thanks for stopping by too!!! Oh wow, these cookies are adorable, you did such a great job on them! Yum! Thanks. Ps love your munchkins - all so cute! Joined your lovely blog. These are so cute! And pretty! And girly! I'll bet you have girls there who went wild for these. Perfect for the winter holidays! These are so cute. You always come up with wonderful ideas. Thanks for sharing all your creativity. Your cookies are SO cute!! These fantastic, I just joined your blog and I'm in awe of so many creative ideas and recipes you have. I just saw those chocolate cinnamon hearts..I love cinnamon and chocolate What a great combo! Finally made these last night and this morning. The 10-year-old actually whipped up the dough, rolled flat and jelly rolled them then placed in freezer while we did our grocery shopping. I cut the frozen dough and we baked them - BEAUTIFUL - then let them cool overnight. Made the soft center filling this morning (before breakfast) and worried, at first, that the 1/8 tsp. mint wouldn't be enough - but I stuck with the recipe. SO glad I did. These are beautiful, scrumptious, delicately mint cookies that will now be in our "favorite recipes" binder. Shared (most of) them with the cookie exchange today. Thanks for sharing! I am Ashley from Simply Designing. I have been asked to host the Holiday Countdown on Nickelodeon's parent's website ParentsConnect. 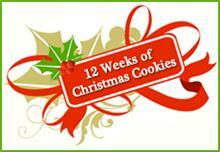 It is a great month-long countdown that, every day, I will be featuring great ideas / crafts and recipes! They also offer chances to win prizes every day just by leaving a comment! Feel free to check out ParentsConnect Holiday Countdown, link to it and let all of your followers know that you can be found there! And if you have a moment, come and join me for the Countdown! I am posting a new topic every weekday the entire month of December!